The most important pathogen likely to be present in liquid, frozen, and dried eggs is Salmonella. This organism may occasionally be present within the egg at the time of laying, but much more commonly it contaminates the liquid egg from the external surface of the shell during the breaking of the shell. (d) inadequate heating of egg products (e.g., those used for infant feeding) before consumption. Mandatory pasteurization of liquid egg should eliminate these hazards. However, any salmonellae surviving pasteurization or contaminating the product subsequently may be expected to survive freezing or drying. Thus, salmonellae remain a potential hazard in egg products, because of the opportunities for multiplication that may arise from time/temperature abuse after thawing or rehydration. (a) Shell eggs: Sampling plans are not proposed for shell eggs. The aerobic plate count (APC) may be regarded as an indicator of the quality of the raw material before processing and also of the possibility of contamination after processing; it may be usefully applied at port-of entry, manufacturing, and retail levels. This test is more applicable at the point of manufacture than at the port of entry, particularly when there is no record of manufacturing procedures. The age and condition of the intended consumer should also be considered. The very young, the elderly, and the infirm are more susceptible to infection so more stringent sampling plans should be applied to egg products destined for such customers. The criteria suggested in taking the Salmonella sampling plan as case 11 are consistent with those of the Codex Alimentarius Commission (Codex, 1978). Unpasteurized eggs are shipped between countries, and represent a serious hazard as vehicles for the dissemination of salmonellae. There is a wide range of manufactured foods which contain egg products. It is not possible to generalize in terms of sampling plans for indicator organisms, because of the major contributions that non-egg ingredients may make to these populations. 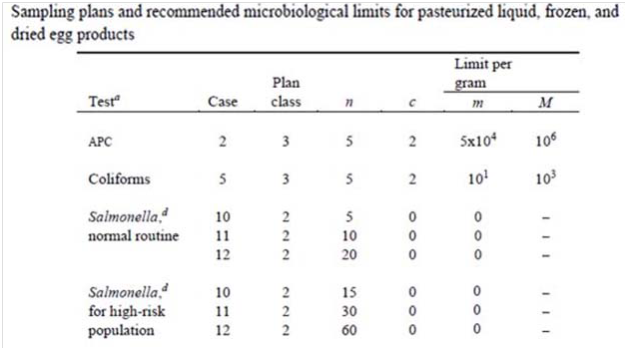 The most important pathogens in such foods are likely to be salmonellae and, where they are considered to be a hazard, the criteria for salmonellae is shown in in Table. Egg sample may be frozen, liquid, and powdered products. The sample usually consists of unopened containers, such as hermetically sealed cans or consumer packs (e.g., dehydrated egg products).The required number of sample units should be selected, which may be individual or composited sample units from individual cans or packs. Drill diagonally through the frozen material in the can after opening with aseptic precautions. The sterile drill should be used, and about 50 g scrape of the drillings collected into a sterile container with a sterile spoon. Alternatively, a modified plastic funnel may be used with the electric drill to collect samples. The sample unit should be thawed for not more than 90 minutes at room temperature, or placed at the required amount of analytical unit directly into an homogenizer with the pre-enrichment medium in the case of Salmonella testing, or into appropriate diluents for other tests. Open the original container or laboratory container (waxed carton or plastic bag) taking aseptic precautions, and spoon the appropriate amount of analytical unit directly into the pre-enrichment medium in the case of Salmonella testing, or into appropriate diluents for other tests. The outer surface of egg shell should be swabbed with the sterile swab and appropriate dilution should be made.